With each successive trip to the beach this summer, we’ve been trying to pick off CTMQ items. 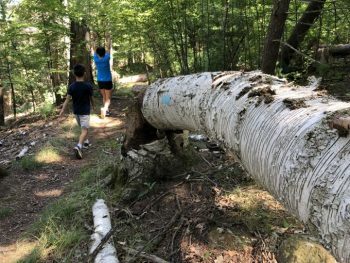 A Freedom Trail site here, a rock of interest there. But mostly, and keep my beautiful wife happy with my pursuits, we’ve been knocking eats off the “500 Things to Eat Before It’s Too Late” list. I can report I’m about a third of the way through the list as of this writing. Aside from the seven ice cream joints around the state, I’m sure Hoang was/is most excited about the two lobster rolls on the list. 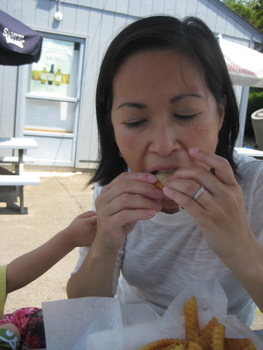 While not really a high maintenance wife, Hoang does enjoy her lobster. 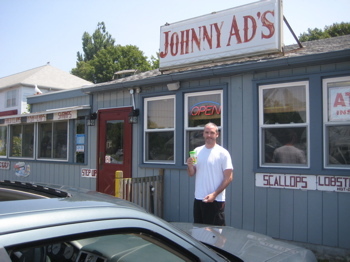 So we went to Johnny Ad’s near the shore in Old Saybrook for lunch after a morning at the Southeast Connecticut Children’s Museum over in Niantic (CTMQ Visit here). Yes, Damian would get to indulge. I was secretly happy because lobster prices are so ridiculously cheap this year, I thought we’d score a bargain. While this is certainly true of whole live lobster (I’ve bought them this year as low as 4 bucks a pound), I suffered a little sticker shock at the near $16 a pop price of Johnny Ad’s lobster rolls. Eh, whatareyougonnado? 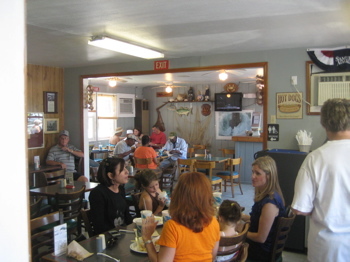 Johnny Ad’s is a step above “seafood shack,” but it does retain some of that shanty feeling. I don’t think it’s contrived here either… Johnny Ad’s really is a bit weathered – and a lot loved. It was crowded in the take-out area and the sit-down restaurant portion had only a few empty tables. Outside, a bunch of picnic tables are situated between the parking lot and Route 1. Not exactly as pretty as a bluff overlooking the Sound, but people come here for the food, not the view. Although it feels like a summer place, Johnny Ad’s is open year around; and other than the deck of picnic tables that make outdoor dining here along Route One such a pleasure, there is a whole indoor dining room for shoreline feasting. And this is a shoreline restaurant, make no mistake about that. Featured menu items include fragile-crusted whole belly clams (or clam strips, if that’s what you prefer), shrimp, scallops, calamari, and soft-shell crab, all available either on a plate with fries and cole slaw or in a roll, which is a toasted buttered bun. Among the superior seafood rolls available is a hot lobster roll: hunks of warm pink meat bathed in butter and nestled in one of those long, tender buns. It is also possible to get a cool lobster salad roll, the pieces of lobster bound with mayonnaise. 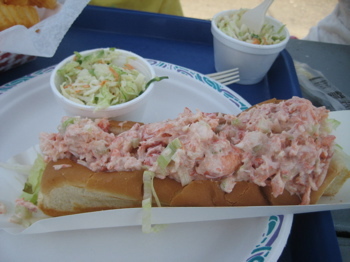 The latter is more typical of New England; the hot roll is a Connecticut specialty, and a lobster-lover’s delight. It is well known under my roof that soggy bread is pretty much the worst thing in the food world. Blech. The roll was excellent, as expected. The lobster meat was pretty chopped up and the largest chunks were maybe nickel-sized. The roll tasted wholly of sweet lobster meat and the lettuce pieces and mayo were only window dressing. We polished off our lobster rolls; and yes, Damian did help out as well (note his little arm reaching for more from Hoang in the above picture) and hit the road. All that was left was comparing Johnny Ad’s rolls to the other one on the list, down I-95 in Clinton. Hoang is definitely not complaining about this list!